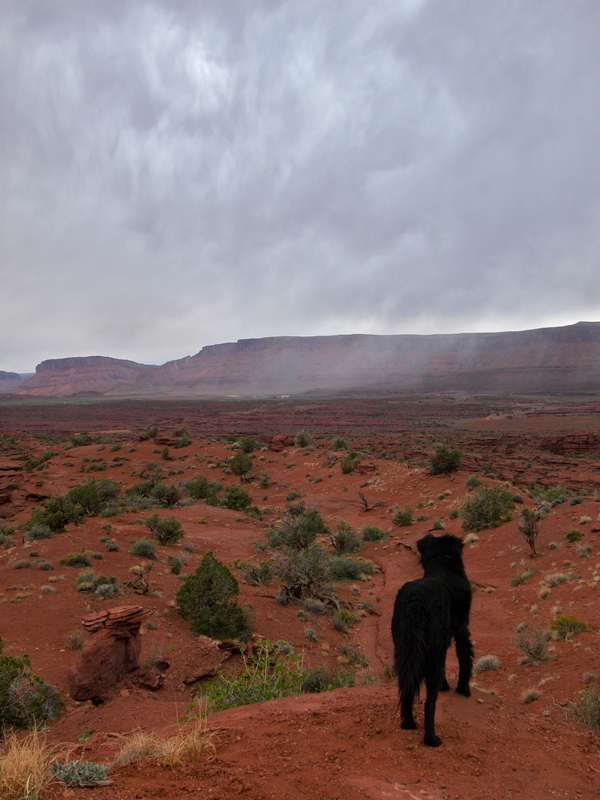 After a few days of rain, grey skies and high winds, everybody in Moab is grumbling. Sitting in a cafe in town, eavesdropping on a group of six climbers plotting their next conquests once the weather clears, the name Castleton Tower catches my ear. I hiked up to the base of it yesterday, leaving behind a few climbers in the parking lot, discouraged by the darkened skies. Sandstone gets slippery and loses some of its strength when wet so threatening skies are a real concern for the rock jocks. I miss climbing, but I’m glad my hiking plans aren’t ruined by a few clouds. I’ve seen some rain off in the distance, but I’ve yet to get wet on this trip! 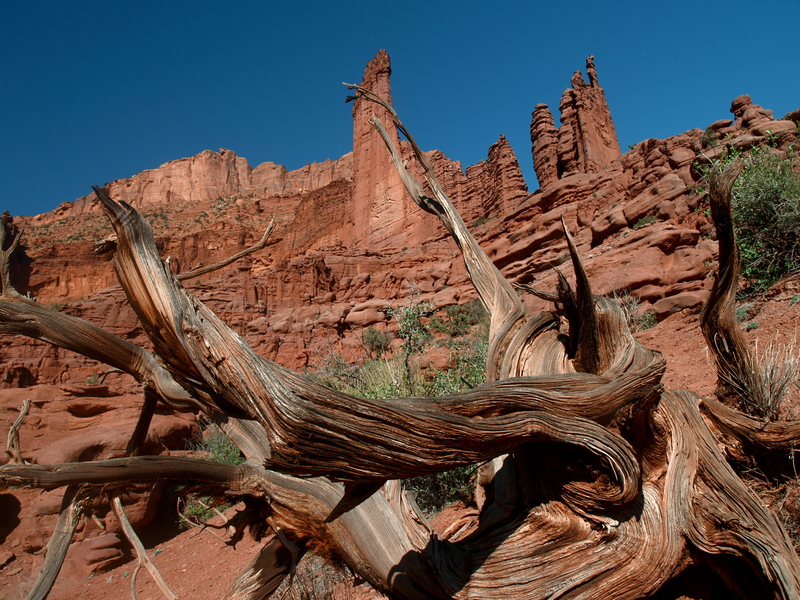 I’ve been camping at Fisher Towers, BLM land just up the Colorado River from Moab. Last time I was here, in 2009, camping was free. Now it’s $12 a night! The times they are a changing. At least the views are priceless, even under grey skies! Rainstorm following the Colorado River from dry Fisher Towers. Nice photos on a stormy day. 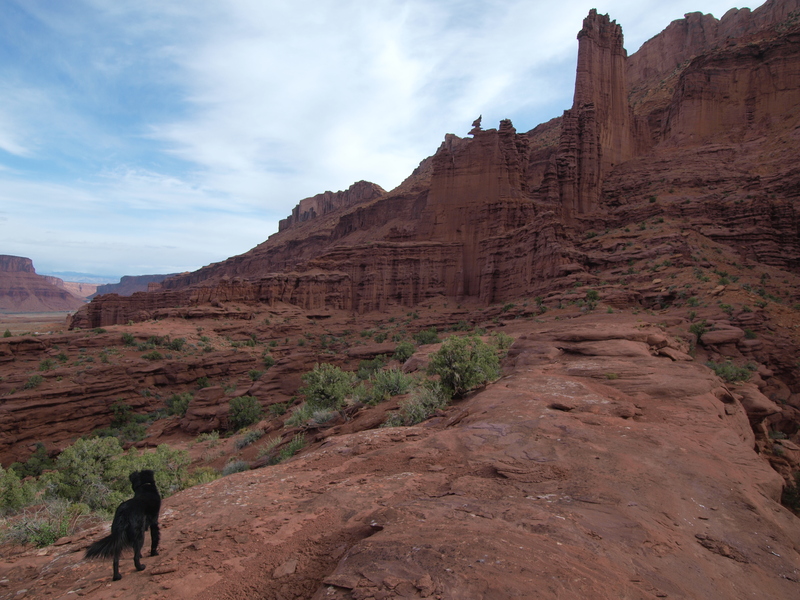 Maggie and I hiked round Fisher Towers in 2009. Thanks for the trip down memory lane! Sure wish we could all get lots of rain here in the southwest. It’s so darn dry. Great photos, but especially the one of the rain falling above the CO river. I’ve been meaning to ask you if you’ve ever heard of Letterboxing? My family’s been doing this fun hobby for over 4 years and have found almost 500 letterboxes so far. The best part is the amazing and unique, off-the-beaten-path places the hobby has taken us. I think it would be a wonderful past-time for you and your dogs to do together as you travel the country, and will give you special hand-carved artwork keepsakes to keep as mementos, too. There are some fantastic letterboxes in and around Moab that we have found. One of my favorite locales and boxes involved some one of a kind petroglyphs: Birthing Rock. 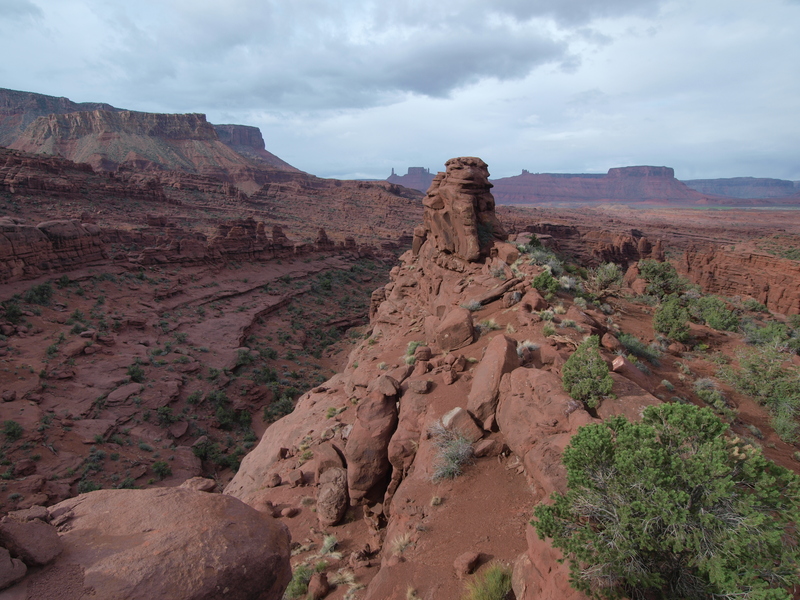 From downtown Moab, head south to the intersection with McDonalds and Burger King. Turn right, this is Kane Creek Blvd. Follow this to the left when you come to the intersection of Kane Creek and 500 West. This road will turn and meander along the river a little ways. There are a few panels of petroglyphs along the rock walls of this road for those with sharp eyes to hunt for. The road will turn into graded, unpaved road as it turns and heads up the canyon. It should be suitable for 2-wheel drive in most conditions. (But is very narrow. Leaving behind your teardrop would be good idea) Your starting point will be around 5.3 miles from the intersection of Kane Creek and 500 West. Just around the bend from the Amasa Back Trailhead (signs mark this), look for a large boulder about 75 feet off the road. It is covered with petroglyphs that are easily seen from the road. There is a pullout just past it. Park here. If you drive and get to a section of switchbacks, turn around and go back, you’ve gone to far! Find it? 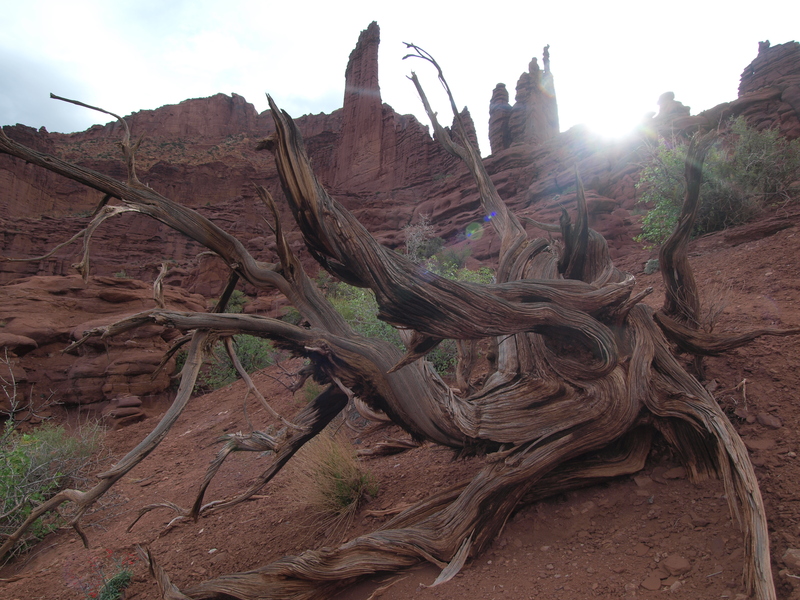 This is your starting point, known as the “birthing rock”.